Power supply mode: 2 * AAA 1.5V alkaline batteries. Support test a total of 11 types of batteries. 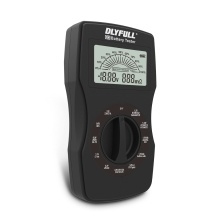 Test the battery voltage, power percentage, internal resistance and other parameters. The battery voltage result is accurate to 2 decimal places. Support test battery percentage (5%, 10%, 15%…90%, 95%, 100%). When the internal resistance is more than 999mΩ, it will turn into "Q" gear, internal resistance has no limitation. Red pens is "+" for the positive electrode; Black pens is "-" for the negative electrode. Low power consumption, saving power and durability. Equipped with a dedicated test USB cable. Please do not store it in a place with high temperature or rain. Don&apos;t use rechargeable batteries to run the tester. Test only one battery at a time. In order to make the test results are accurate, the battery should be contacted well. Do not disassemble or assemble it. If the tester is not used for a long time, it is recommended to take out the alkaline battery in the tester to avoid damage to the tester due to battery leakage. Put into the new alkaline batteries to operate test instrument to ensure the accuracy of test results. Children are required to use the charger under the supervision of an adult.